Space is filling up at Master Workshop: Layer I, where 20+ of the world’s foremost experts on blockchain will present and lead discussions around solutions to the technology’s scalability problem. Don’t forget to register today for free! The most pressing obstacle to blockchain’s march to mass-adoption is its scalability, or current lack thereof. For blockchain to be genuinely useful, it has to cater to the population at scale and provide a fast, functional alternative to traditional transfers. So, when you consider that Bitcoin currently averages around 7 transactions per second (tps) to VISA’s 2000 or PayPal’s 200, the scope for improvement necessary becomes clear. There are numerous different groups now working to find a solution. These fall into two schools of thought. There are those that believe transactions should, as far as possible, all take place on chain, and there are those that see layer II solutions as the only viable way of scaling blockchain out. There are clear and important advantages to keeping transactions on-chain. What layer I generally means is that the entire blockchain is modified periodically to reflect all transactions, with each one logged in finite blocks across every node in the network. Each transaction is ratified by a set number of participants in the chain, then recorded on a block which is dispersed across all nodes – complete immutability. Some view layer I solutions as the only way of sticking to blockchain’s ‘true’ principles of full transparency and intrinsic security. Others, though, see this transparency as problematic in and of itself, and argue that full security can be achieved off chain. On-chain transfers also take a significant amount longer to process given the different steps necessary in making them happen. Layer II solutions go a long way to solving blockchain’s fundamental issues. Ultimately, the thinking is that not every small transaction necessarily has to take place on the chain, rather the chain can be regularly updated to reflect balances. Taking transactions away from the main blockchain alleviates the stress on it. In this case, the blockchain acts as a mediator. It does not actually need to be used unless two parties disagree with each other. Arthur Gervais, assistant professor at Imperial College London and co-founder of off-chain solution Liquidity.Network explained the thinking behind off-chain solutions to Inverse. “Why would you need the mediator if you are actually in accordance with each other?” he says. Off-chain solutions can speed up the blockchain, taking cumbersome transactions away from the primary chain and reducing transaction costs by extension. It is currently unclear whether it is possible at all to scale blockchain without using some form of off-chain solution. In fact, it is unclear whether it will be possible without a combination of a number of different off-chain solutions working together to keep the main chain ticking over. Both have their positives and their drawbacks. Increasingly, though, those working on scalability acknowledge that a combination of both is likely the only way forward for blockchain. It’s important that we aren’t put off by the complexity of combining both layer I and layer II solutions. It’s also vital that solutions aren’t discarded because they are initially cumbersome in their complexity. One of the key arguments for layer II solutions is that not every transaction needs to be logged for all to see on the main chain. There are privacy concerns – not everyone wants their financial history broadcast across a vast network – and there are speed issues that cannot be justified. Lefteris Kokoris Kogias, cryptocurrency expert and PhD researcher at EPFL, echoes Mustafa’s position, understanding that while on chain solutions are more secure, there is a realistic necessity for off-chain. “Layer I and layer II solutions are both needed,” he explains. “Having to globally announce that you spend 5$ at Starbucks might be an overkill, but even if most transactions are in layer II we still need a layer I with good capacity to handle settlement and dispute. We also spoke with PhD researcher at UCL, Sarah Azouvi. For Sarah, the combination of layer I and layer II solutions is possible only if a functional UX can be developed to facilitate it. “Both layer I and layer II solutions are interesting lines of research to solve blockchains’ scalability problem,” Sarah says. “I do see layer I solving the issue as there are a lot of inherent problems with layer II solutions, such as keys management, routing or multiplayer channels. Layer I solutions are said by some to be the only way of achieving a truly democratic blockchain, in which all transactions are visible and properly ratified by an appropriate number of agents. They also, in theory, remove the need for the third-parties that are sometimes used in off-chain solutions. We put this to Sarah, who believes it is a lot more complex than that. Ultimately, there seems to be a consensus among the majority of the community that utilizing both layer I and layer II solutions is a no-brainer. What exact combination we end up seeing from the myriad solutions being developed is anyone’s guess, but using both offers the security and speed that will help blockchain to scale effectively. Collaboration has always been one of blockchain’s strongest assets, and going forward, even slightly opposing ideologies will have to combine. 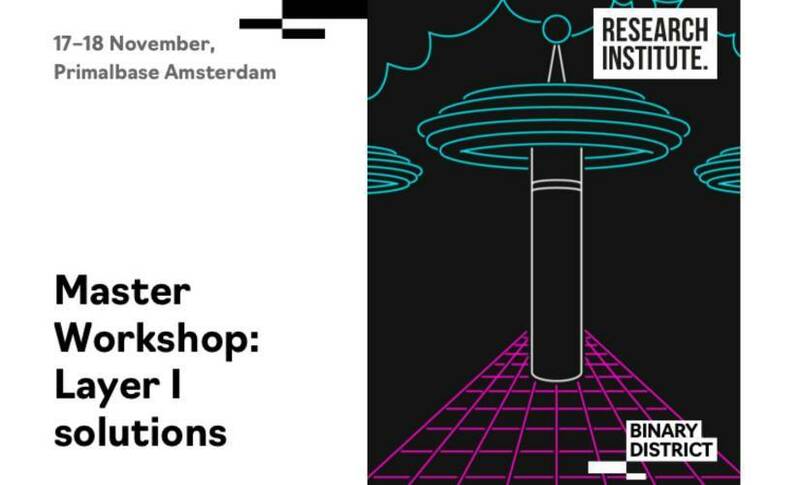 The ‘Master Workshop: Layer I Solutions’ event, in Amsterdam 17-18 November, will bring together those working on every corner of layer I scalability. From the DAG-based cryptocurrency framework, to the creation of secure, scalable decentralized ledgers via sharding, the workshop will be a space for the sharing of ideas and the comparison of solutions from expert to expert. The event will see Sarah, Mustafa and Lefteris speaking alongside more than 15 leading experts from across the blockchain space, including Philipp Jovanovic, Christopher Carr, and Ewa Syta, among others. No sales pitches, just pure tech. Conversation and collaboration with the best in the business. Don’t miss your chance, register for free today! Every new technology starts with a novel idea - something that didn’t exist before but has the potential to challenge and change the status quo. Binary District Collaborative technology community unveils these ideas, shares the latest trends, and reveals the secrets behind the most successful technology companies. The ultimate goal of Binary District is to build a strong community of researchers and developers, foster learning and innovation, and facilitate conversations that push technology industries forward. Each program is developed in close collaboration with industry experts, researchers, and developers.